By raising Lazarus from the dead before Thy passion, / Thou didst confirm the universal Resurrection, O Christ God! / Like the children with the palms of victory, / We cry out to Thee, O Vanquisher of death; / Hosanna in the Highest! // Blessed is He that comes in the Name of the Lord! When we were buried with Thee in Baptism, O Christ God, / We were made worthy of eternal life by Thy Resurrection! / Now we praise Thee and sing: / Hosanna in the highest! // Blessed is He that comes in the Name of the Lord! Sitting on Thy throne in heaven, / Carried on a foal on earth, O Christ God! / Accept the praise of angels and the songs of children who sing: // Blessed is He that comes to recall Adam! We are still in need of a large bookcase for the fellowship hall, as we are expanding our library. If you have one, please contact Fr. Andreas. Parish Meeting will take place May 19th, and not May 12th as the email this week said. Please try to be there, as we will discuss things pertaining to the future of our community. There will be an ongoing reading of the Book of Acts at the Tomb on Saturday. Please talk to Anna South if you would like to participate. During Bright Week, we will have Paschal Vespers on Wednesday night (6.00 PM), and Liturgy on Thursday morning (7.00 AM). Following the forty days of the Fast, and immediately before the days of darkness and mourning of Holy Week, there come two days of joy and triumph. This Saturday celebrates the raising of Lazarus. The miracle is performed by Christ as a reassurance to His disciples before the coming Passion: they are to understand that, though He suffers and dies, yet He is Lord and Victor over death. The event foreshadows Christ’s own Resurrection eight days later, and at the same time it anticipates the resurrection of all the righteous on the last Day. This is the feast of Christ the King – welcomed by the children at His entry into Jerusalem, and to be welcomed likewise by each one of us into our own heart. 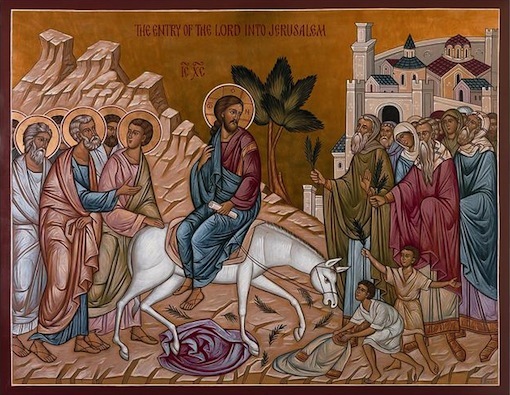 On Palm Sunday we welcome not only the Lord who entered Jerusalem long ago, riding on a donkey, but the Lord who comes again in power and great glory, as King of the Future Age. Palms are blessed at Vespers the evening before and are held throughout the services of the Feast. The days following His entry to Jerusalem Christ spoke to His disciples in particular about the signs that will precede the last Day – this forms the theme of the first part of Holy Week. This is summed up in the moving troparion of the Matins service: “Behold the Bridegroom comes in the middle of the night….” These services re-present the urgent call of all Great Lent: the End is near; be watchful; repent while there is still time. On this day we fast, remembering the sufferings of Christ: the mockery, the crown of thorns, the scourging, the nails, the thirst, the vinegar and gall, the cry of desolation, and all that the Savior endured on the Cross; also the confession of the Good Thief. At the same time, the Passion is not separated from the Resurrection; even on this day of our Lord’s deepest self-abasement, we look forward also to the revelation of His eternal glory. At the end of Vespers this day the “Epitaphion” (Gr.) or “Plashchanitsa” (Slav. ), i.e. the Burial Shroud of Christ, is carried in procession from the sanctuary to the center of the church, placed in the tomb, and venerated by the faithful. We celebrate the burial of Christ and His descent into Hell. At Matins, served Friday Evening the Lamentations, or funeral service, of Christ is sung before the Tomb. God in the flesh now observes His Sabbath rest in the tomb, but we look forward to the moment when He will rise again, bringing new life and recreating the world. At the end of the service a procession is made around the church – indicating Christ’s triumphal procession through the darkness of Hell, announcing to Adam His coming Resurrection. Vesperal Liturgy the morning of Holy Saturday has a strong baptismal character. Three connected themes of Passover, Resurrection, and Baptismal initiation – reflected in the prescribed fifteen Old Testament readings – dominate the service. In the tomb Christ is already triumphant over the gates of Hell; thus the colors change from dark to white at this service in anticipation of His glorious Resurrection for us on earth. Late this evening we will gather once again in the darkened church for the midnight service of Nocturns. All wait in silence and contemplation for the moment the priest will come out from the sanctuary with a burning candle symbolizing the light of the risen Christ at the very first moment of that glorious Third Day.